What are Wisdom Tooth Impactions? When a wisdom tooth erupts through the gums and into the open it’s known as eruption. 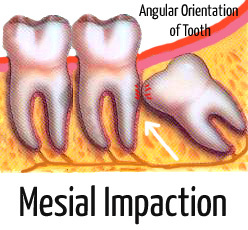 Impaction is where the third molars (wisdom teeth) erupt improperly. There are four types of impaction. Some of them mean you need wisdom teeth removal, whereas others are perfectly harmless. We’re going to go through each of the four impactions and determine whether they would warrant an extraction or not. Many patients, and dentists alike, are quick to assume that impacted wisdom teeth automatically need removing, this is not always the case and each person should be thoroughly examined and x-rayed before this important decision is made. Wisdom teeth removal is classed as surgery, and should therefore always be the last resort when it comes to treating the problem. The mesial impaction is the most common type of impaction. 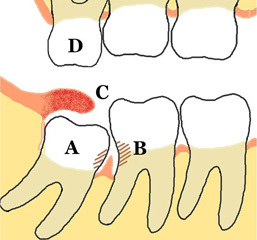 It’s where the wisdom tooth is angled towards the front of the mouth. It pushes against the molar in front of it. The angle of the mesial impaction determines whether it becomes a problem. It most often leads to a partial eruption where only the back of the tooth pokes into the gums. In many cases, you can leave it without having it removed. Over time, it might erupt properly. Dentists normally place these impactions under inspection unless it’s clear it will never erupt. 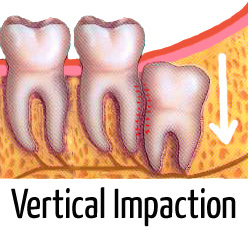 The vertical impaction almost never requires wisdom teeth removal. It’s an almost normal orientation and there’s a very high chance they’ll erupt and fit in the mouth without any real problems. If a vertically impacted wisdom tooth does need removing, it’s because it’s pushing against the underside of the molar in front or the bones at the back of the mouth. These are difficult to remove and often result in damage to the surrounding teeth and bone areas. It’s rare for a vertical impaction to be this serious, though. Vertically impacted wisdom teeth can normally be extracted by your dentist using a local anaesthetic. IV sedation would only be required in the case of an extremely nervous patient. 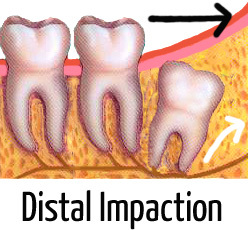 The distal impaction is the least common type of impaction. It’s the exact opposite of the mesial impaction as the tooth is angled towards the back of the mouth. It doesn’t have a higher chance of needing a wisdom tooth removal. It depends on how dramatic the angle is. If it’s almost pointing towards 0 degrees, it will erupt as normal but will always have a slight incline. It will fit in the mouth and dentists will normally give it a year or two before they make a decision on whether they need to remove it. Distal impactions which are towards a 90 degree angle will hit bone and probably won’t erupt fully. It’s usually up to the dentist as to whether they say the tooth needs removing or not. Depending on the severity of this impaction, IV sedation or even general anaesthetic may be required to undergo the surgery. 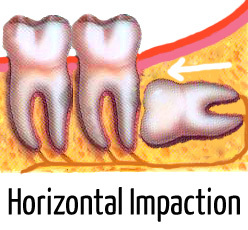 The horizontal impaction is arguably the worst kind of impaction to have. It’s pointing completely away from the surface and towards the molar in front of it. There’s no variation in the angle it’s pointing towards. It’s completely horizontal and is running parallel to the jawbone. It needs removing or it can start to damage the surrounding teeth. The difficulties presented by this impaction are the surgery and the fact the dentist can’t see it apart from with an x-ray. It takes a lot of skill to complete this type of wisdom tooth removal without causing trauma to the surrounding area. As this kind of impaction could result in having to remove some bone, general anaesthetic or IV sedation is generally recommended. The patient should also be prescribed painkillers and a thorough after care plan to minimise discomfort and possible post-surgery complications. Make sure you always use an experienced dental surgeon for this kind of procedure to minimise the damage caused to the surrounding area. If wisdom teeth removal surgery has been recommended, you should be thoroughly informed of what will happen during the procedure. Don’t be afraid to ask questions, and if you don’t feel comfortable with your dental surgeon, remember you can always walk away and find another one! MacGregor, A.J. The impacted lower wisdom tooth. Oxford University Press, 1985, ISBN 0192614053. Reinhard E. Friedrich, Carsten Ulbricht, The influence of wisdom tooth impaction on root formation, Annals of Anatomy - Anatomischer Anzeiger, Volume 185, Issue 5, October 2003, Pages 481-492, ISSN 0940-9602. Lennart Flygare, Anders Öhman. Preoperative imaging procedures for lower wisdom teeth removal. Clinical Oral Investigations, December 2008, Volume 12, Issue 4, pp 291-302. Arne Björk, Elli Jensen and Mogens Palling. Mandibular growth and third molar impaction. 1956, Vol. 14, No. 3 , Pages 231-272, doi: 10.3109/00016355609019762.